Dreading spring cleaning? Don't worry: These products will make your house sparkle in no time. 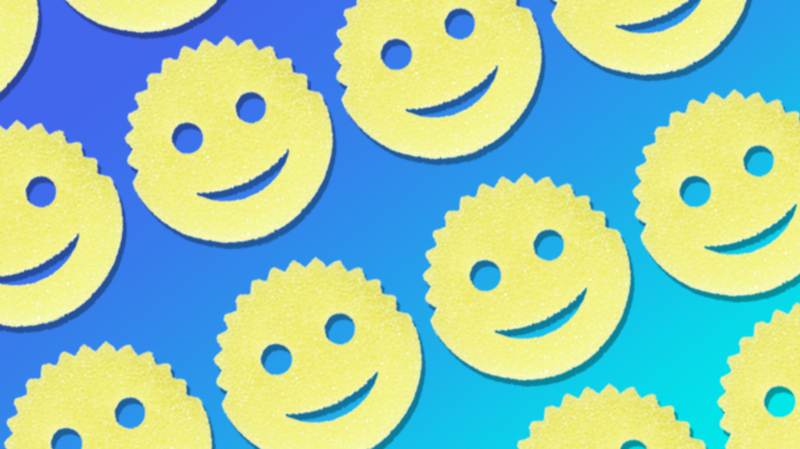 The Scrub Daddy is no ordinary sponge—and that's not just because of its smiling face. The scrubber alternates between soft and rigid, depending on the temperature of the water you rinse it with. Gently wipe down dishes with a soft, warm sponge, or tackle harder stains with a colder, harder sponge. The product is the darling of Shark Tank, and it currently holds the title of being the top performing item from the show. In fact, if Bon Appétit is to be believed, it's the only Shark Tank product worth buying. Anyone with a light colored carpet knows the struggle of keeping it clean. This rug rejuvenator scrubs more vigorously than you could ever do by hand. It has two sets of rotating bristles that massage the carpet shampoo into the fibers. Once the shampoo dries, the crystals and dirt can all be easily vacuumed up. The simple cleaning process gives a deep and balanced clean that will make your carpet look and feel brand new. Say goodbye to cumbersome cords and cables with a completely wireless vacuum. This popular Dyson vacuum is battery powered and runs on a digital V8 motor that can last up to 40 minutes. The powerful vacuum is great for getting dirt that's deeply wedged into corners and carpets, and you can even remove the handle and use the smaller handheld option for harder-to-reach areas. The Swiffer Wet Jet is an improved version of the already beloved Swiffer mop. Similar to its predecessor, the flexible mop has a special, disposable pad that dirt clings to. What sets the Wet Jet apart is the battery-powered stream of cleaning solution that you can expel with the push of a button. As you might expect, wet floors are much easier to clean, and the cleaning solution leaves a refreshing smell. Once you've finished sweeping, getting the pile into a dustpan can prove to be a bit of a problem. This unique dustpan aims to make the process somewhat simpler by removing the handle. Instead, the device has a spot for your foot to keep it in place while you sweep in debris. And as a bonus, it even has a little comb on the side to clean out the broom when you're finished. Getting caked-on food off of the inside of a microwave is going to need more than just a sponge and some elbow grease. Use this "angry mama" cleaner to help loosen up the gunk first. Simply fill it with water and a bit of vinegar and microwave. The steam from the head will soften the splatters and help remove any funky odors. If you haven't swept in a while, you might notice your socks beginning to pick up bits of dirt and hair—but now you can do that on purpose. Make your footwear work for you with these slippers that double as microfiber mops. Now you can clean your floors without even thinking about it, and then toss the slippers into the wash afterward. You can't go wrong with a classic. The well-known household staple has earned a place in clean kitchens across the country thanks to its ability to cut through thick messes on most surfaces without leaving streaks. It even got a shout-out from Good Housekeeping as the Best Overall multi-purpose cleaner. OK, these gloves may look ridiculous, but hear us out. When the sponge is built right onto the glove, it's one less thing to worry about, and having scrubbers attached to your fingers makes it easy to apply just the right amount of pressure to scrub off dried-on or burnt food residue. Bar Keepers Friend is about to be your friend for polishing appliances and cookware. The substance is tough on rust, lime, stains, and tarnish and comes with a non-scratching scourer cloth. Use it on white porcelain sinks and tubs, pots, pans, and anything else that needs a new shine. Dirty keyboards and other gadgets are often the last things on your list to clean up. Now you can happily check it off first, using this giant yellow glob of goo. The Silly Putty-like substance is perfect for grabbing little bits of dust, dirt, and snack residue from your laptop, phone, and anything else with lots of nooks and crannies.